The holidays are here, and 2019 is around the corner. You suddenly realize that the job search you vowed to start early is now behind schedule. Don’t panic! You still have time to start your holiday job search — Just use our guide and the holiday calendar to plan, prioritize and set deadlines for achievable milestones. Create a checklist of criteria so you can objectively prioritize your search. Be sure your CV is ready to submit for practice opportunities that meet your criteria. Finalize your short list of appealing communities and organizations. Identify your references and alert them to possible inquiries. Share the details of your career and personal goals with a trusted recruiter. You can rely on their objectivity, network of connections and knowledge of the marketplace. They will help focus your search and avoid roadblocks, without charge or obligation. With holiday calendars (and available flights) filling up, be quick and decisive about scheduling interviews. Outline pertinent questions about compensation, practice parameters and the community. Start phone interviews in December and schedule on-site interviews to take place just after New Years. Assess your progress, including upcoming interviews and offers on the table. Ask for feedback to understand where any disconnects occurred. Share that information with your recruiter – you need objective advice! Plan your follow-up steps. If no offers are in hand, you may need to change the parameters of your search and conduct more due diligence to improve your chances of success. Prioritize the offers you have received. Compare compensation packages using trusted sources for salary surveys and calculators that incorporate multiple variables. Consult trusted advisors who can help compare the variables and explain contractual terms. Be prepared to make a decision. Celebrate the sweet success of accepting an offer! 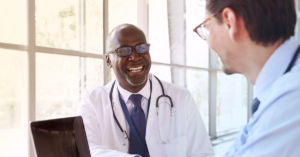 Meet the deadlines for securing your license, hospital privileges and credentialing with payers. Explore housing and make relocation plans. The opportunity to earn a stipend, signing bonus or another incentive for early commitment. Less stress and fewer scheduling conflicts during their final semester of residency. Peace of mind to enjoy their first few months after graduation. The opportunity to be productive in your practice as soon as you arrive. Finding your first or next practice opportunity can be challenging and overwhelming. An experienced recruiter can ease the process and serve as a guide through the process. They know the hiring organizations first-hand and have visited the practice sites you’re considering. They will streamline the process and keep you on track. 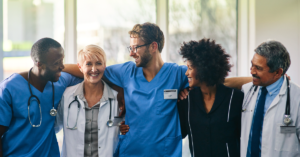 Get started now by exploring Jackson Physician Search opportunities and learning why physicians choose to work with Jackson Physician Search recruiters.